Sales of bottled water in the United States have increased dramatically since the 1980s. This increase is largely due to an effective advertising campaign that directly appeals to fitness-conscious Americans looking for healthy alternatives to tap water. These campaigns emphasize the purity of bottled water through advertisements and packaging labels featuring impressive glaciers and flowing mountain springs . However, a significant portion of bottled water is merely bottled publicwater-supply water, perhaps polished by a carbon filter or other devices prior to bottling. In other words, the water in the bottle may actually come from a municipal well in an urban area. Depending on the situation, bottled water may not be safer than tap water, but Americans are still drinking record amounts of it. According to the Beverage Marketing Corporation, Americans spent approximately $6.5 billion on bottled water in 2002, with each U.S. citizen drinking an average of 74 liters (19.5 gallons). 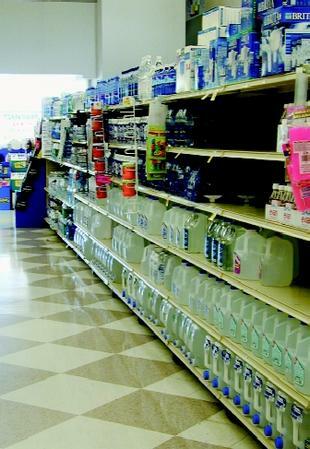 Sales of bottled water increased by 225 percent in the 1990s. There are several different categories of bottled water, based on the nature of the water and its source. Nonsparkling water includes artesian, spring, purified (including distilled), and mineral. Artesian water is drawn from a well in a confined aquifer , and often refers to a naturally flowing well. Spring water is taken directly from the spring or from a well adjacent to the spring that draws water from the aquifer feeding the spring. Purified water can be produced through distillation, filtration, or some other water treatment process. Mineral water naturally contains more than 250 parts per million of total dissolved solids. (No minerals can be artificially added to this water nor can it be drawn from a municipal source.) A new type of bottled water comes from icebergs, which are chunks of glaciers at sea. Sparkling water can be any type of naturally carbonated water. (Soda water, seltzer water, and tonic water are not considered bottled waters.) Some natural waters can be both naturally carbonated and highly mineralized; moreover, they may be delivered to the surface via flowing artesian wells. Domestic nonsparkling water accounts for over 94 percent of all bottled water sold in the United States, whereas sparkling water and imports each have an approximate 3 percent share of the market. Americans collectively drink more than 20 billion liters of bottled water each year. Wholesale value of the bottled water market has risen steadily since 1990.
shipped in interstate commerce specify that independent of the product name, the source of the water bottled must be identified. Many individuals purchase bottled water as a matter of convenience, for hiking, sporting events, and other activities. Others purchase bottled water because they believe that it is safer than either public water supplies or private self-supply (usually from wells). Bottled water may taste or look better than public-water-supply water, but it is not necessarily safer. The U.S. Environmental Protection Agency regulates public-water-supply water through the federal Safe Drinking Water Act. Bottled water, however, is regulated through the federal Food and Drug Administration (FDA). The FDA is required to adopt the same standards as those required by the Safe Drinking Water Act. Moreover, the FDA regulates bottled water as a food product, and bottled water companies must comply with the FDA's Quality Standards, labeling regulations, and Good Manufacturing Practices. In addition, the International Bottled Water Association has prepared a model program for their members that includes adherence to all state and federal regulations as well as random, unannounced inspection visits. Although bottled water must generally meet the same safety standards as public-water-supply water, the EPA requires frequent, often daily, monitoring of public drinking water, whereas the FDA requires testing only once a year for bottled water. In addition, the FDA regulations only apply to water that is sold in interstate commerce. According to the Natural Resources Defense Council, approximately 60 percent of all bottled waters are sold in the same state where they are bottled; hence, FDA regulations do not apply. At the state level, bottled water is covered by state regulations and industry standards. Many states have even more stringent standards than the FDA, while others either refer to or duplicate the FDA standards. However, roughly one in five states do not regulate bottled water, or have lax regulations or no enforcement powers. Fewer than half of the states require artificially carbonated waters such as seltzer water, soda water, or tonic water to meet bottled water standards. Despite these considerations, American consumers continue to drink huge quantities of bottled water. Understanding the nature of public drinking-water supplies, privately bottled water, and the regulations governing each will help consumers make informed decisions about the safety of the water they drink, and the advantages—if any—of purchasing bottled water. SEE ALSO Aquifer Characteristics ; Drinking-Water Treatment ; Fresh Water, Natural Composition of ; Fresh Water, Natural Contaminants in ; Fresh Water, Physics and Chemistry of ; Groundwater ; Ice at Sea ; Mineral Waters and Spas ; Privatization of Water Management ; Senses, Fresh Water and the ; Springs ; Supplies, Protecting Drinking-Water ; Supplies, Public and Domestic Water ; Wells and Well Drilling . Bottled Water: Pure Drink or Pure Hype? Natural Resources Defense Council, 1999. Lamoreaux, Philip E., and J. T. Tanner, eds. Springs and Bottled Waters of the World: Ancient History, Source, Occurrence, Quality and Use. New York: Springer Verlag, 2001. Siskos, Catherine. "Bottled Water Everywhere." Kiplinger's Personal Finance Magazine. vol. 52, no. 9 (Sept. 1998): 47. Groundwater and Drinking Water. U.S. Environmental Protection Agency. <http://www.epa.gov/safewater/index.html> . International Bottled Water Association. <http://www.bottledwater.org/> .